BMAH Awarded BEST in Somerset County! We wish to extend our sincere thanks to all of our valued clients and supporters who voted for us in the 2018 Courier News Readers Choice contest. 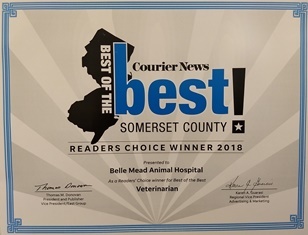 The Belle Mead Animal hospital team has once again been awarded “Best in Somerset County,” and we could not have achieved this award without you. We appreciate your continued confidence in our team to provide the most compassionate care possible for your pets. All the animals that come through our door – dogs, cats, exotic companion mammals, birds, reptiles, goats, pigs – are special to us. They are part of your family, and we consider them part of our BMAH family, too. 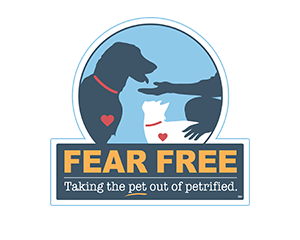 With our “Fear Free” approach, we are committed to making your pet’s experience in our hospital comfortable and pleasant. A comfortable and relaxed pet is not only easier to treat, but also has a better chance of recovery from illness or injury. Thanks for giving us the opportunity to make life better and healthier for pets and families in our community.